﻿ Colts Rugby: Where Have All the Players Gone? Colts Rugby: Where Have All the Players Gone? Having done a few years of coaching at my rugby club I have decided to take a bit of a break this year and focus on the role of Chairman, which has included watching quite a lot of rugby matches on Saturdays and Sundays. Ok, I have a bit of a vested interest as both my sons are now playing senior rugby and one remains eligible to play in our Colts, so I’m getting to see quite a few games. I have had an especially good view of the Colts games, which I have been asked to referee each time we host one. Colts rugby in our region seems to be in a bit of trouble. The CB insists that there are more clubs with Colts teams than ever before, but on the pitch these teams do not seem to materialise. It is interesting to see the difference between what happens on the ground and the data supplied by clubs. Now there are very many things which can take up the attention of a 16 / 17 year old away from rugby, including college, jobs, social lives, etc., but you still have to question – where have all of the players gone? Teams which have fielded vast numbers of players at mini level now struggle to amass 10 Colts players. Maybe these players are running out for their clubs on a Saturday (having hit 17 years of age and been suitably signed off and assessed) but the fact that in our region massive numbers of 2nd and 3rd team games have been cancelled as clubs struggle to field teams makes that unlikely. So what is the problem? Where have all of these young players gone? My view is that clubs are adopting the wrong approach and picking sides that focus on winning matches from age 10 upwards. I struggle with the concept of the New Rules of Play restricting numbers of players on pitches as I think this will have a bad outcome. Coaches need to see that by playing players weekly as they develop instills the love of the game, the idea of one team working for each other and actually growing the player base for years to come. The win everything approach at youth level (where we don’t even play in leagues) is meaningless and, in my opinion, now impacting the game massively. 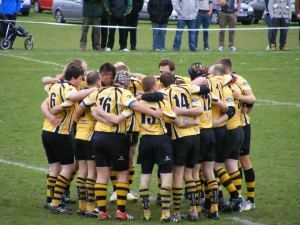 Getting Colts into the senior sides has to be the ultimate goal but giving them the opportunity to play in a Colts team, to work on stuff, play at a quicker pace and working on their own leadership skills can only be a good thing for all of our clubs – and that alone assists their transition to the senior level. At least at our club the Colts coach is the 2nd XV captain and we regularly see senior players assisting him with training or coming to support the Colts on a Sunday morning. Mini and Youth coaches have to ask themselves what the purpose of them coaching really is. Is it to win a game at Under 13s on a cold Sunday morning or is it to develop players who will go on to play adult rugby? I suppose with the few years I have been coaching some of my proudest moments are watching guys who I coached at 5 and 6 years old run out with our 1st XV or that of another club and play a game they absolutely love.